BACKSTORY: This living room is located in an older home just north of the University District in Seattle. The homeowners wanted the space to be comfortable and look "finished." DESIGN DIRECTION: The front door of this home opens into the living room. Before it's rebirth, this space was treated as a pass-through and only used to get to the back of the house. 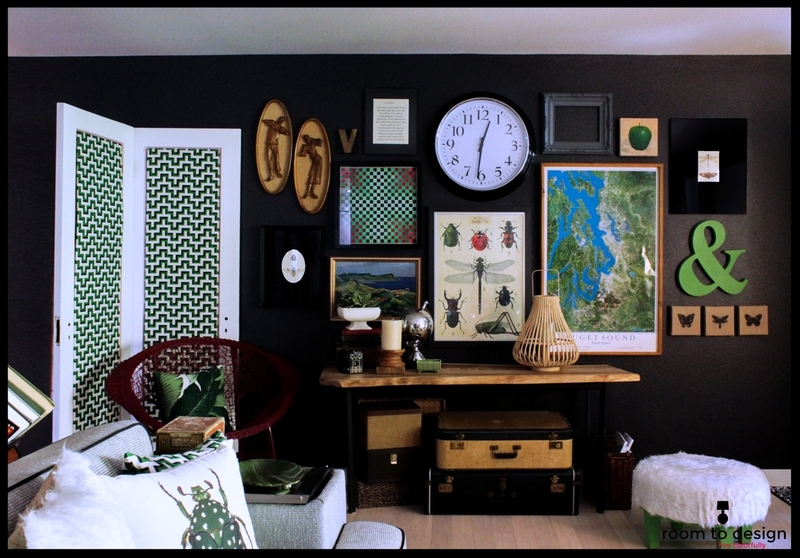 With the use of color, pattern and texture it is now a place where the homeowners want to spend most of their time. Taking cues from gorgeous mountain ash tree in the front yard, I developed a color palette of green, deep orangey red and yellow. A new sofa in a soft but durable texture anchors the seating arrangement. A new oval ottoman with a fun print adds function without impeding the traffic flow. We reupholstered the two chairs added new end tables and lighting, as well a new rug and artwork. The beautiful custom draperies fame the large windows without blocking the light and adding the finishing touch that completes the room. BACKSTORY: When we moved to our new house, I picked up our old living room, rearranged it slightly and put it in the new space. After finishing up the rest of the spaces in the house, it was time to give the living room a fresh new look. DESIGN DIRECTION: This is the first room visitors see when they come in the house. I wanted it to be an introduction to my design style, a space that would make people want to stop and take notice. The drama starts with the choice of dark gray paint for the walls. 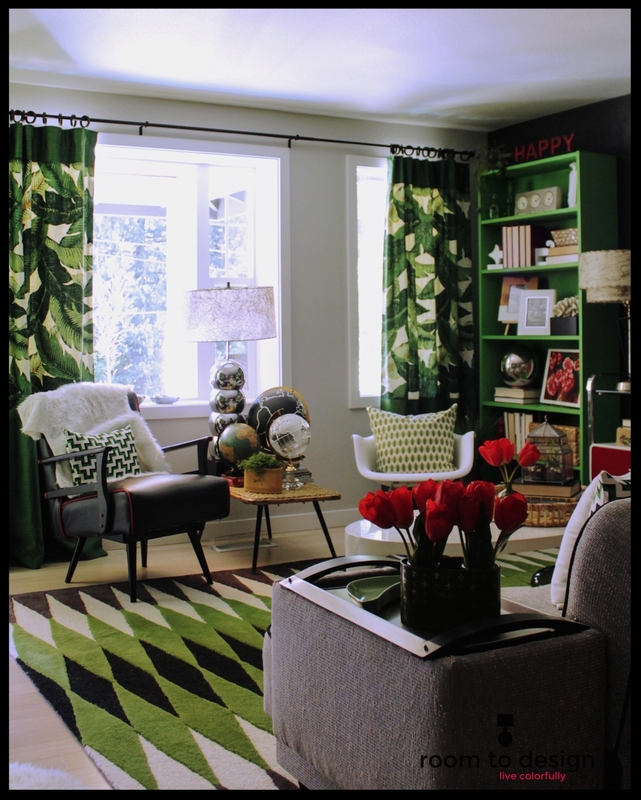 Pair that with the saturated green of the book cases, graphic pattern on the rug and the fabrics and you have unexpected design. I also had quite a few pieces of furniture and large artwork that I wanted to incorporate. I used a lot of black and bright white to balance the those pops of red and introduced several natural elements to calm the bold colors and shiny finishes. BACKSTORY: This poor house just needed to be rescued. It had been "abused" for many years by an owner/contractor who had no plan in mind and just started tearing it apart. I walked into the light filled great room and immediately knew I could give it some love and make it whole again. DESIGN DIRECTION: The two Nanawall doors give balance to the back wall and create a starting point for furniture placement. 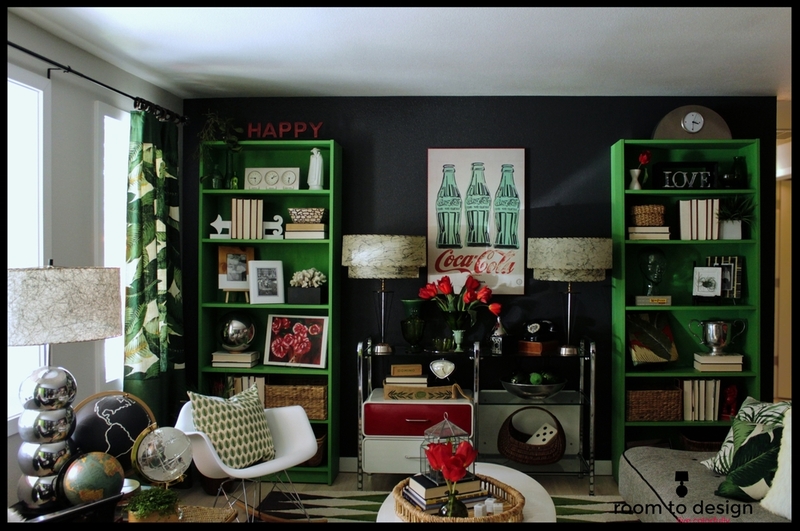 The family spends most of their time in this room and wanted it to be lively and multi-functional. Bring on the color! The jumping off point for the palette starts with the beautiful drapery fabric and explodes from there. 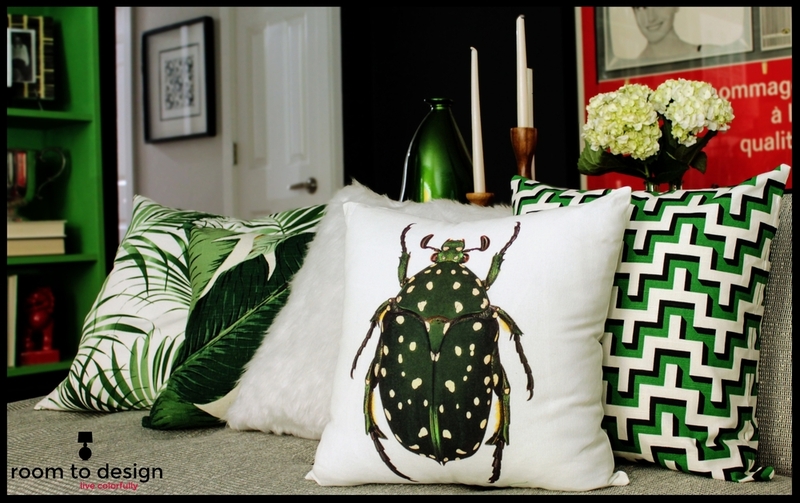 I added to the colorful aesthetic by painting and recovering a mix of estate and garage sale finds as well as sourcing affordable pieces from Ikea and online retailers. BACKSTORY: Essentially, this home had no functioning kitchen, only the promise of one. Taking down the wall to the great room not only opened up the space, but opened opportunities for interaction between the two spaces. DESIGN DIRECTION: The first item on the agenda, take a small space and make it functional. Second, use every inch and maximize storage. Lastly, make it fun and pretty. The quartz countertops are practical and beautiful. I used a dark quartz around the perimeter to visually expand the space; and light quartz for the island to keep things from getting too heavy. The cabinetry layout makes the most of the limited storage space by utilizing deep cabinets on one side of the island and narrow cabinets on the front that act like a pantry. Shots of color in the art work and lighting speak to the color in the adjacent great room and make the kitchen a fun place to hang out! BACKSTORY:This master suite started out life as two back-to-back bedrooms. Closing off one bedroom door and tearing out a wall where each closet met, the two became one, a retreat for the restless connected to a place for getting ready to take on the day. DESIGN DIRECTION: The key to keeping this restrained color palette interesting is the use of pattern and texture. Furnishings re-imagined from the dumpster mixed with high end fabrics and window treatments are a budget friendly way to get a custom look without having to give up food.